This is an excellent historical fiction children’s book, set in France in 1788, just prior to the French Revolution. It brings us right into the palace of Versailles, as well as into the streets where the peasants are starving. And it does it all through the eyes of a young girl, who has been befriended by the princess, and tries to reconcile the two worlds. As a reader who admittedly knew very little about the scene prior to the revolution, I found this children’s book immensely educational. At the same time, it was a terrific read, as one could imagine how a young peasant girl would be smitten with palace life, until she saw the real costs of it. 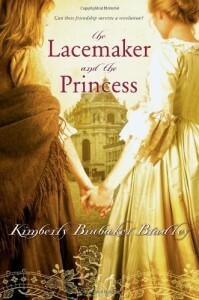 The characters are based loosely on a true event of a young girl befriended by Maria Antoinette’s daughter. It is riveting to read about the immense waste and opulence in the palace at the same time that there is not enough bread for people to eat. At the same time, one feels some compassion for the royalty, as it feels the situation is more one of ignorance than sheer evil. But isn’t that often the case? This is a terrific way to introduce the history of the French Revolution to classrooms. Since the French Revolution is probably a topic in high school, I would say that the book may also appeal to older, 12- to 14-year-olds, especially girls.